A couple of weeks ago, a friend asked if I had read the most recent Alice Hoffman book yet and I replied that I hadn't actually read any Hoffman books. Chris (yes, again) was shocked and then suggested that I immediately resolve that by reading the very small YA novella Green Witch. 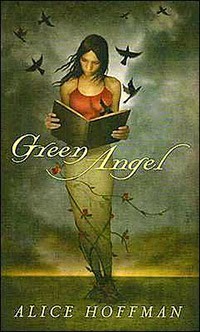 I saw that it was the sequel to Green Angel so I grabbed both from the library and spent a day with a beautiful and sad young woman. In the first part of the story, Green sadly loses her mother, father and younger sister when terrorists attack the local city while they are there selling vegetables. Green stayed home that day and feels the unique guilt and grief combination left to survivors. She wallows in the grief, letting her ash-damaged eyes remain untreated, her once-productive fields lay fallow, and accumulating a body full of self-inflicted black tattoos -- until a mysterious stranger arrives to help her come back to life. 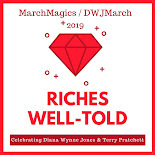 In Green Witch, Green sets out to finish her healing process and to help others to recover from their losses and to find those things that mean the most to them. I loved these two tales. They are deceptively short and simple but hold deeper truths about life, love, loss and healing. There is just enough magic in them to make them interesting but not so much that it takes away from the humanity of the stories. Now I suppose I will have to seek out more of Hoffman's books, probably starting with The Museum of Extraordinary Things. I've never read any of Hoffman's books either. I'm adding these ones to my 2015 list! Fantastic! They really do just take an afternoon to read. You've never read any Hoffman before? Oh, goodness. She's one of the authors I STOPPED reading, because I was nervous I'd get to the end of her books before she wrote another one. Please read Here On Earth. And Practical Magic. And The Drowning Season. And....well, any that grab your fancy, because they are wonderful. I'm so glad you found her! Isn't it weird. Somehow none of her books ever got on my radar. At least I have a few ahead of me now!